It is a well-known fact in the medical world that vitamins are essential for normal body function. There are a variety of vitamins in our food with some vitamins being synthesised in our skin upon exposure to sunlight. The B vitamins in particular are important in a number of metabolic processes that occur within our body. More recently however, there has been interest in vitamin B12 and vitamin B6 in particular, as they are now considered to play an important role in weight loss. We are going to cover off Vitamins B6 and B12 for Weight Loss in this article. Vitamin B12 is also called cobolamine as it contains the element cobalt within its structure. It is a water-soluble vitamin that is essential in maintaining the function of a number of different organ systems in the body, particularly the brain and nervous system. In addition to this, it is essential for the synthesis of haemoglobin and patients who are deficient in vitamin B12 can be anaemic. Vitamin B12 also helps maintain healthy nerve cells and red blood cells, and also is needed to make DNA, the genetic material in all cells. Vitamin B12 is bound to the protein in food. Hydrochloric acid in the stomach releases B12 from protein during digestion. Once released, B12 combines with a substance called intrinsic factor (IF) before it is absorbed into the bloodstream. Vitamin B12 is available in a number of animal foods. Deficiency of vitamin B12 is seen in people who consume a strict vegetarian diet. Patients who are deficient in vitamin B12 tend to suffer from tiredness and lethargy. In such a situation, patients may be administered vitamin B12 injections which can help them recover from this tiredness and regain the normal energy levels. All of these B vitamins help the body in converting carbohydrates into glucose or sugar, which is burned in order to produce energy for proper body function. These are often referred to as B complex vitamins, and are essential for the breakdown of fats and proteins. They help maintain muscle tone, protect the mucus lining in the digestive tract and mouth, and promote upkeep of nervous system and the organs like the liver, skin, hair, and eyes. Cobalamine is an excellent anti-stress vitamin since it is believed to enhance the health functioning of the immune system and improve the body’s ability to fight stressful conditions. The Recommended Dietary Allowance (RDA) is the average daily dietary intake level that is sufficient to meet the nutrient requirements of nearly all (97 percent to 98 percent) healthy individuals in each life-stage and gender group. The 1998 RDAs for vitamin B12 (in micrograms) for adults are 2.4 µ g and the results of two national surveys, the National Health and Nutrition Examination Survey (NHANES III-1988-91) and the Continuing Survey of Food Intakes by Individuals (CSFII 1994-96) found that most adult men and women consume recommended amounts of vitamin B12. There has been a fair bit of discussion regarding vitamin B12 being effective as a weight-loss supplement. However, there does not appear to be any strong evidence from scientific studies that confirms this. In fact, a low vitamin B12 levels can cause weight loss by itself and supplementing the patient with vitamin B12 should help patients regain their lost bodyweight. On the other hand however, vitamin B12 is required to break down carbohydrates ingested in the diet into usable sugars. Whether or not this will actually aid weight loss is questionable. It has to be borne in mind that taking vitamin supplements over and above what the body requires can actually be harmful. While no significant harm has been shown by excessive intake vitamin B12 through food, artificially supplementing it through injections may be harmful. In simple terms this could be explained by the fact that the body will only absorb what is required from the diet and not anything over and above that. Vitamin B6 is also called pyridoxine and like vitamin B12 is a water-soluble vitamin. It occurs in a variety of forms most of which are active within the body. Vitamin B6 is essential for the breakdown and use of protein molecules (amino acids) and also in the synthesis of glucose within the body. It also helps break down fats as well. It also is essential for red blood cell metabolism. The nervous and immune systems need vitamin B6 to function efficiently, and it also is needed for the conversion of tryptophan (an amino acid) to niacin (a vitamin). Hemoglobin within red blood cells carries oxygen to tissues. Your body needs vitamin B6 to make hemoglobin. Vitamin B6 also helps increase the amount of oxygen carried by hemoglobin. A vitamin B6 deficiency can result in a form of anemia that is similar to iron deficiency anemia. An immune response is a broad term that describes a variety of biochemical changes that occur in an effort to fight off infections. Calories, protein, vitamins and minerals are important to your immune defenses because they promote the growth of white blood cells that directly fight infections. Vitamin B6, through its involvement in protein metabolism and cellular growth, is important to the immune system. It helps maintain the health of lymphoid organs (thymus, spleen and lymph nodes) that make your white blood cells. Animal studies show that a vitamin B6 deficiency can decrease your antibody production and suppress your immune response. Vitamin B6 also helps maintain your blood glucose (sugar) within a normal range. When caloric intake is low, your body needs vitamin B6 to help convert stored carbohydrate or other nutrients to glucose to maintain normal blood sugar levels. While a shortage of vitamin B6 will limit these functions, supplements of this vitamin do not enhance them in well-nourished individuals. The Recommended Dietary Allowance (RDA) is the average daily dietary intake level that is sufficient to meet the nutrient requirements of nearly all (97 percent to 98 percent) healthy individuals in each life-stage and gender group. The 1998 RDAs for vitamin B6 for adults, in milligrams, are 1.3 mg for men and women ages 9-50 and 1.7 mg and 1.5 mg for men and women over the age of 51, respectively. Vitamin B6 is also available in a variety of foods such as whole grain, nuts, vegetables and meat. Low consumption of vitamin B6 and consequently low levels in the blood can cause skin disease and inflammation of the tongue and cheeks. 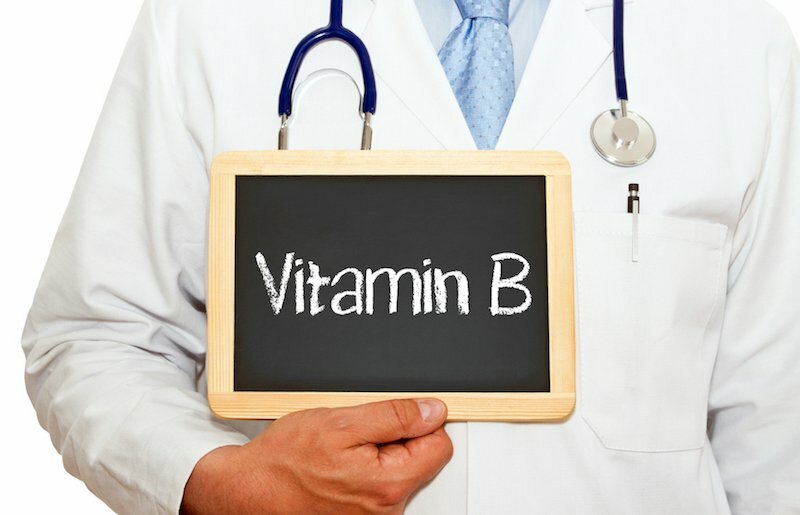 Clinical signs of vitamin B6 deficiency are rarely seen in the United States. Many older Americans, however, have low blood levels of vitamin B6, which may suggest a marginal or sub-optimal vitamin B6 nutritional status. Vitamin B6 deficiency can occur in individuals with poor quality diets that are deficient in many nutrients. Symptoms occur during later stages of deficiency, when intake has been very low for an extended time. Signs of vitamin B6 deficiency include dermatitis (skin inflammation), glossitis (a sore tongue), depression, confusion and convulsions. Vitamin B6 deficiency also can cause anemia. Some of these symptoms also can result from a variety of medical conditions other than vitamin B6 deficiency. It is important to have a physician evaluate these symptoms so that appropriate medical care can be given. As is the case with vitamin B12, there does not appear to be any strong evidence supporting the role of vitamin B6 in weight loss. However, if one were to look at the functions of vitamin B6, it is evident that it is required to break down food and burn excess fat by stimulating the metabolism of lipids. The problem of course is that getting excess vitamin B6 can actually be harmful as it can over-stimulate the thyroid gland. By doing so it can actually cause weight loss but this is an unhealthy way to go about doing it. Vitamin B6 and vitamin B12 are essential for normal body functioning. However their role in weight loss is not backed by any strong evidence. Diet and exercise remain the best ways to lose weight and should be observed more strictly. For more information on the IAPAM’s Physician Medical Weight Loss Training, visit our event website at the Aesthetic Medicine Symposium or call 1-800-219-5108 ext. 708. I have witness an outside contractor with our company, gradually lose weight over several months getting B12 injections by her doctor. She was overweight and is now shrinking body fat and looks slender; so I be to differ about whether B12 can help with weight loss. I am sure some entities have something to either lose or gain by saying there isn’t scientific evidence to confirm statements. I see with my own eyes. Finally, I have started taking B12 liquid drops and have notice weight gradually falling off me – I wasn’t even stressing to lose any but did and continue to. You can also prevent clogging with the arteries helping within the functioning in the circulatory system not only, nevertheless the nervous system, digestive and respiratory systems. exercises which should be done oon regular basis. Better lung volumes typically follow a healthy backbone thhrough chiropractic therapy. Ongoinhg healthcare reform policies support participation of Specialty practices in this care model. The B comp injections are administered intramuscularly by a nurse and not by the patient. hCG injections are administered subcutaneously by the patient while on the diet portion of the program. The B comp is given every two weeks not 3 times a week. I was over weight and tired. I started taking Vitamin B stress tabs and have lost much of my belly fat and I feel much better. Where did u purchase vitamin b stress tabs?